Things to consider when buying woodworking clamps. A craftsperson’s collection of tools is always interesting. For instance, you can glean all sorts of details about a woodworker, their art, and their expertise by the selection of clamps they keep. As a result, knowing how to select the right clamps is a big part of a woodworker’s growth. However, many would agree that it boils down to five major things to consider when buying woodworking clamps. What purpose the clamps are serving. Bar and pipe clamps are perfect for clamping boards when you’re edge-gluing. 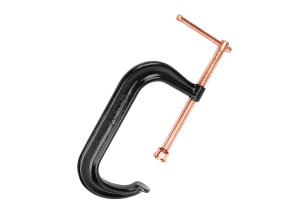 The versatile F-clamp is a favorite for a wide variety of projects. 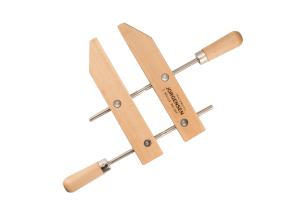 These hardy clamps work beautifully when clamping wood to a bench while sanding or carving, and for reliably clamping router tables and belt sanders to work benches. Another handy clamp is the handscrew clamp, best known for its great reach and adaptability. 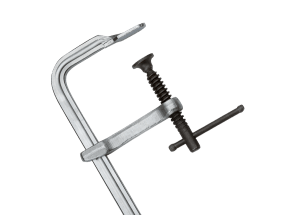 These clamps have an excellent strength-to-weight ratio, making these strong, lightweight bar clamps perfect for both commercial and DIY applications. The bars are crafted from an anodized, rust-resistant aluminum, and their rectangular design creates a stable clamping surface for edge gluing. The tail-stop’s trigger spring takes advantage of notches on the bar to lock into place. What metals are being used. The type of metal used in a clamp’s construction affects its structural integrity. High-quality ductile cast iron, drop-forged, high-carbon steel, and anodized aluminum are common preferences because they make for strong and reliable clamps. Additional zinc and chrome plating guarantee greater durability. Metal plating also helps protect your clamps from the natural elements by keeping them rust-resistant. The Jorgensen drop-forged heavy-duty bar clamp is an insanely strong clamp. Its drop-forged steel bar is chrome plated to ward off rust longer. As a result, not only does it deliver a strength unmatched, it also offers superior rust resistance. Additionally, a heat-treated acme screw provides increased durability. What type of wood is being used. If wooden parts are going to be used in a clamp, such as in handscrew clamps, they should always be made from a solid hardwood, like maple or oak. For clamps with ergonomic wooden handles, it’s important to ensure that the wood offers a soft, comfortable grip. A useful trick to test the quality of the wood is to simply try to scratch it with a fingernail. Wood that does not scratch easily will serve you longer than its softer counterpart. Seasoned, straight-grain hard maple wood jaws marry with cold-drawn steel spindles and nuts with special double-lead threads. 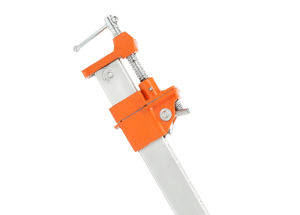 Together they create a handscrew clamp that holds tightly over broad areas, providing greater reach and a wider distribution of pressure than other woodworking clamps. How the handles feel in your hand. Over the years, many a woodworker has often felt that a clamp begins to feel and function like an extension of their own arm. With time, a clamp begins to take on aspects of your very art and skill. But not till your clamps fit and feel just right in your hand. Which is why handles are so very important. Plastic handles will last just as long as wooden ones, if it is the right kind of plastic. Contoured handles will keep from digging into your hand. Ergonomic handles are your best allies, so keep them close. Throughout this clamp’s range of opening, the point of pressure always remains at the lightweight, zinc-plated steel jaw tips to ensure they’ll hold your work together exactly where you need them. Available poly-vinyl protected handles and jaw tips mean you can use them on metal, wood, plastic, fabric, and beyond. The amount of clamping force required. Many woodworkers often make the mistake of underclamping during glue-up. The key to clamping success is simple: apply the right amount of clamping force for the type of wood you’re using. It’s important to remember that different species of wood require different clamping pressure. Dense and tight-grained woods typically need higher clamping forces. Moreover, wood orientation (flatsawn or quartersawn) also determines clamping force need. The toughest jobs demand a tougher clamp. 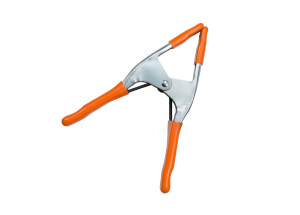 These strong C-clamps are crafted with heat-treated, drop-forged carbon steel frames, copper-coated screws, handles, and swivels for heavy-duty industrial service. The anvil is extra large and broached for flatness. This terrific clamp can pack up to a whopping 9,300 lb. of clamping force. What factors do you take into account when you’re buying clamps? Let us know if they made our list.